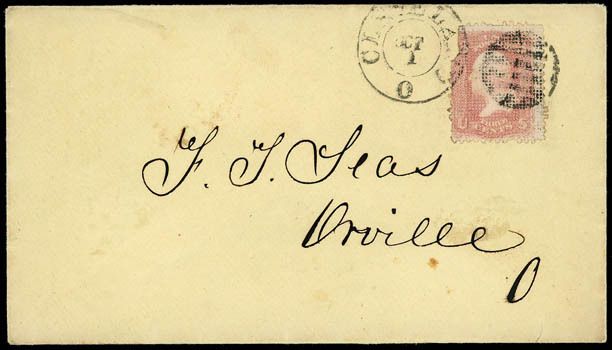 1867, 3¢ rose, A. grill, strong allover grill impression, tied by neat "Cleveland, O., Oct 1" cds and grid duplex on cover to Orville, O., with original 1867 billhead notice; stamp with upper left corner nick showing the difficulty of separation of this issue, otherwise Very Fine, an attractive and very scarce early usage. 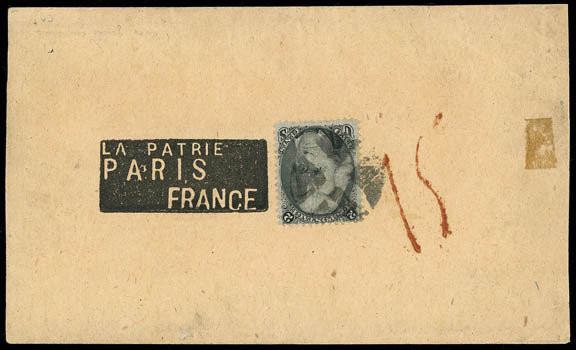 1867, 2¢ black, F. grill, tied by quartered cork on manila wrapper with negative black address to Paris, France, red "15" centimes due rating handstamp; small tape stain at right, F.-V.F. ; with 2003 P.F. certificate. Scott No. 93 Estimate $200 - 300. The 2¢ adhesive paid the 1864 U.S. rate of 2¢ for each piece of printed matter. 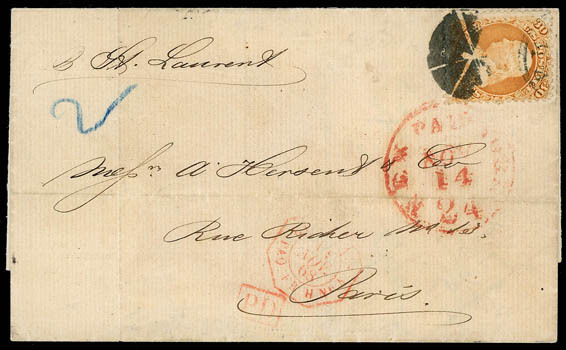 15 centimes was due from the addressee (12c printed matter rate, plus 3c fiscal tax on incoming printed matter). 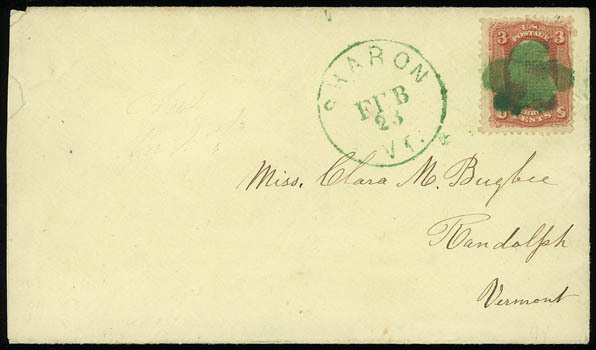 1867, 3¢ red, F. grill, tied by vivid green cork cancel on cover to Randolph Vt., matching green "Sharon Vt Feb 23" cds; small faults, Very Fine and attractive; with 2006 P.F. certificate. Scott No. 94 Estimate $150 - 200. 1867, 30¢ orange, F. grill, strong grill impression and color, tied by circle of wedges cancel and part of red "New York 'Paid 24' Nov 14" exchange cds on 1868 folded cover to Paris, France, blue crayon "2" for double weight, red French Packet "Paq. Fr. H. No. 4, 14 Nov 68" octagon datestamp and matching "PD" framed handstamp, carried by French Line St. Laurent from New York Nov 14th to Havre arriving Nov. 25th, Paris (11.25) arrival backstamp, Very Fine and scarce French packet use; with 1988 P.F. certificate. Scott No. 100; $2,000 on cover Estimate $500 - 750.